Posted on Mon, Mar 19, 2012 : 7:22 p.m.
Deputy Ray Yee, Sgt. Beth Gieske, part of the community engagement team orchestrating the Citizen's Police Academy, and Sheriff Jerry Clayton outside the Washtenaw County Sheriff Office on Hogback Road. 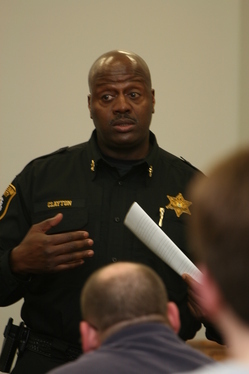 When Jerry Clayton became the new sheriff in town nearly four years ago, he brought with him substantial changes as well as new ideas for the about 400 employees of the Washtenaw County Sheriff’s Office and its about $45 million budget. One of the things he accomplished was the reduction of about $950,000 in overtime costs; another was multiple-year contract prices for deputies to assist townships in the budgeting process. In addition, a community engagement arm was created to look at the “root cause of the problem of crimes” as well as ways "to build bridges with the community,” with problem-oriented policing, said Derrick Jackson, director of community engagement. They also employed a “street outreach team” which included ex-cons to help them improve upon their results. Also part of this bridge is the creation of a Citizen’s Police Academy, a 10-week course that teaches residents about the multi-faceted aspects of the office. This class, currently under way, marks the third group of about 35 students who answered an email to participate. They hail from the cities Ann Arbor, Milan, Saline, and the townships of Northfield, Pittsfield, Scio, Superior, Sylvan and Ypsilanti and meet in the jury selection room for the 14A-1 court. He hopes that members of this class will be part of a volunteer corp that will help spread the office's engagement message. Enrolled are an eclectic group that includes engineers, a caterer, an automotive designer, retired automotive employees, a retired bailiff, a ham radio operator, an economist, a crossing guard, a school board member, a social worker and a retired nurse. And although he is the leader of the office, the leadership team consists of Undersheriff Mark Ptaszek, who has worked under four previous sheriffs; Chief Deputy Rick Kaledas; two commanders, Dieter Heren and Sherry Woods; and Jackson. 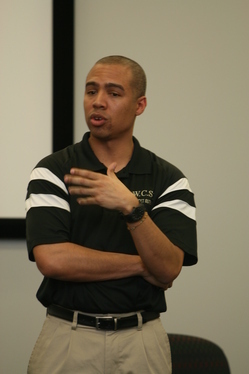 As part of its redirection to look for a root cause of a problem to reduce specific crimes, Jackson told students about the E.A.S.Y. prostitution project on the east side of the county along the Michigan Avenue corridor. In fact, the sheriff’s office partnered with the City of Ypsilanti and Ypsilanti Township targeting both prostitutes and johns and imposed a “no prostitution zone” for offenders as part of their bond agreement. Those charged were told “If you don’t live there, you can’t go back there,” Jackson said. For the prostitutes, counseling and assistance for substance abuse problems - a major cause for their crimes -- has been implemented. Another example is the Macarthur Boulevard area of Superior Township where “3 percent of the population” was responsible for “90 percent of the time” that deputies were spending in the township, Jackson said. Although “there was not a lot of trust in the sheriff’s department in the neighborhood, the office got together community leaders, landlords, building owners, business owners and residents and worked toward changing that perception with a 25-task plan "to change the culture in the community." There has been a constant police presence in the area for three years, Jackson said, and "month after month, there have been less calls." "We can't prevent every crime from happening," he said, "But we are building the community up." These were just a few of the scenarios where strides are being made. “Through service excellence and crime prevention our goal is to improve the quality of life in the county and build strong sustainable communities,” Clayton said. If you have questions you’d like asked about the operations of the sheriff’s office, feel free to email me at lisaallmendinger@annarbor.com. Tue, Mar 20, 2012 : 1:21 p.m. It sounds like a great program. Give credit to sheriff Clayton for his vision. However, I hope the citizen police are thoroughly trained on the Constitution and they know better than to follow illegal orders. Just following orders don't cut it. Citizen police can be a great thing but it can also be a tool for abuse if not careful. Just remember, the sheriff is the chief law enforcer of the country but he works for us. @timbow Does the training stress the importance of strictly following the Constitution and protecting the rights of the citizens? I would appreciate your input. Tue, Mar 20, 2012 : 12:48 p.m.
As a 'graduate' of this course, I can't say enough about the Sheriff's Office and their commitment to this community. Everyone there understands duty, respect and community support. Get a seat in this class if you can - you'll not be disappointed! Tue, Mar 20, 2012 : 2:22 a.m. Recruiting communities in anti-crime efforts is always vital and always difficult. Jerry Clayton certainly deserves our votes. And he's right: sheriff's are the original constitutional law enforcement officers. I'd far rather have sheriffs saving us from danger than (also constitutional) militias. The former buys their uniforms with courage, ability and recognized authority: the latter buys their uniforms from... Cabellas.